Our Tree Peonies are normally supplied in 4 and 7 litre pots, although we occasionally have a limited number of older, larger plants available in 15 litre pots. Prices for the plants are available on the Varietes and Prices pages. We send out plants on Mondays and Tuesdays by courier, usually taking 2/3 days to most parts of the UK mainland (a signature is required on delivery). 7 litre - � per order (for 1 - 2 plants). Please phone for carriage prices and timings to other parts of the UK. For large orders, pallets can be made up, but we would need a few days notice to organise the packing and collection. 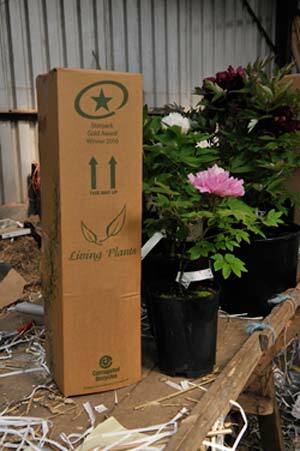 Our peonies are available throughout the year and are well packed and protected before despatch. However, please note if the peonies are in full leaf and flower, some limited damage may occasionally occur.